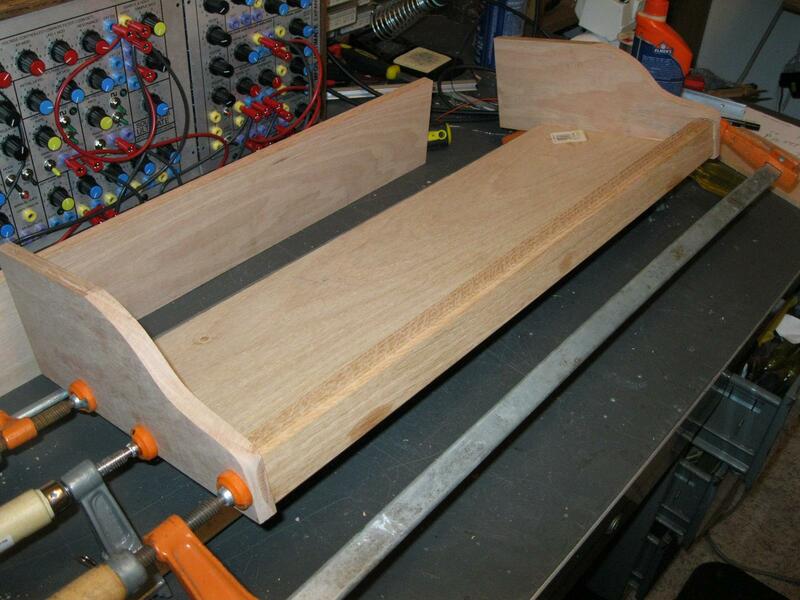 Just about finished - December 2010 - A few bits of trim to add & not varnished yet. In late November I started again, and finished the project in Late December. I spent the majority of the build time on the woodwork. 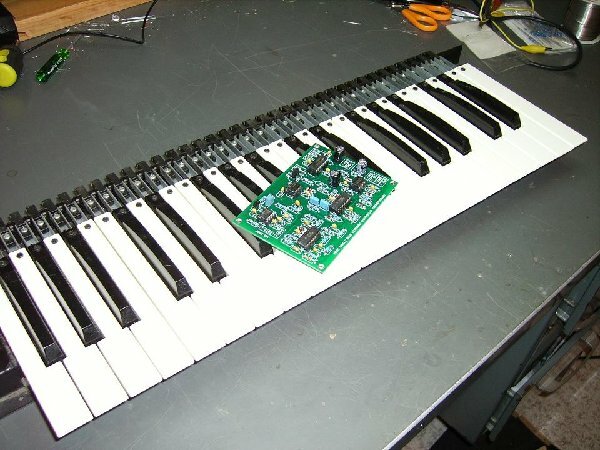 I started the project expecting to build a portable keyboard synth with ability to patch (Banana Plugs) and with an integrated keyboard. 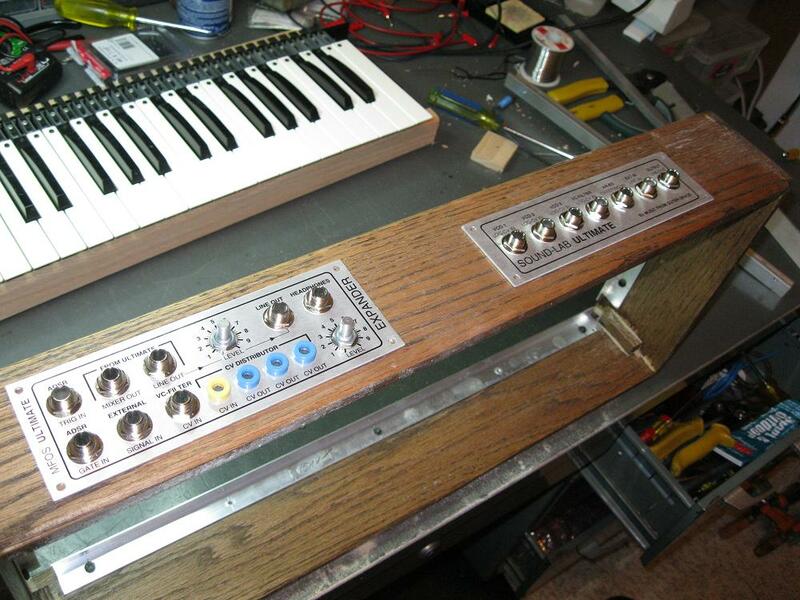 I had envisioned a minimoog sized instrument with a fold down control panel, and had thought I would be able to add a sequencer and perhaps a joystick. As I started building it was still an evolving idea - I had a rough idea of what I wanted it to look like when I was done, and engineered it as I built. I got the Pots and Jacks mounted - Just missing a few 10 K pots I missed on the BOM. 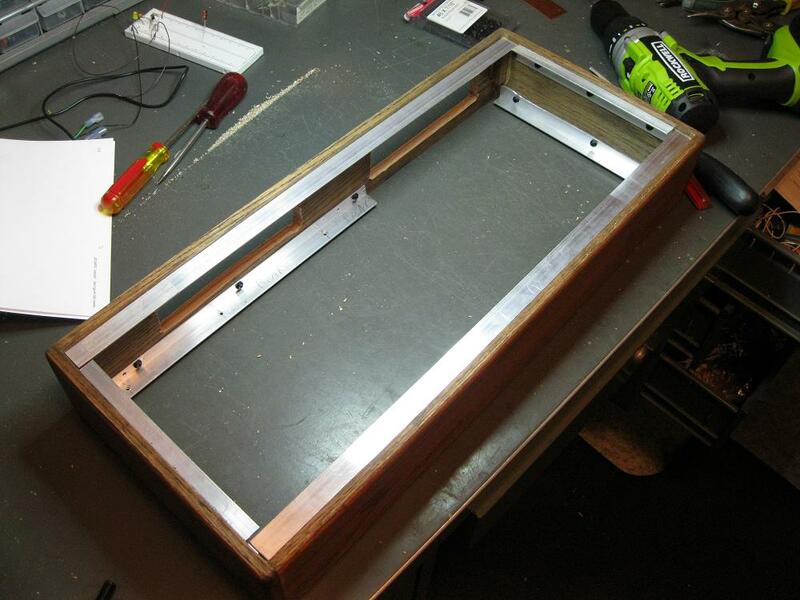 Switches will be mounted next - and then started the common ground wiring on the back of the panels. I got all the panel holes filled, all the IC sockets are providing homes for all the IC's. The power supply will be a perfboard version of Ray Wilson's "WallWart Bi-Polar supply - it's still in the parts bin - but that's a quick build. Just build a case, do all the flying wires and I'm done...right? 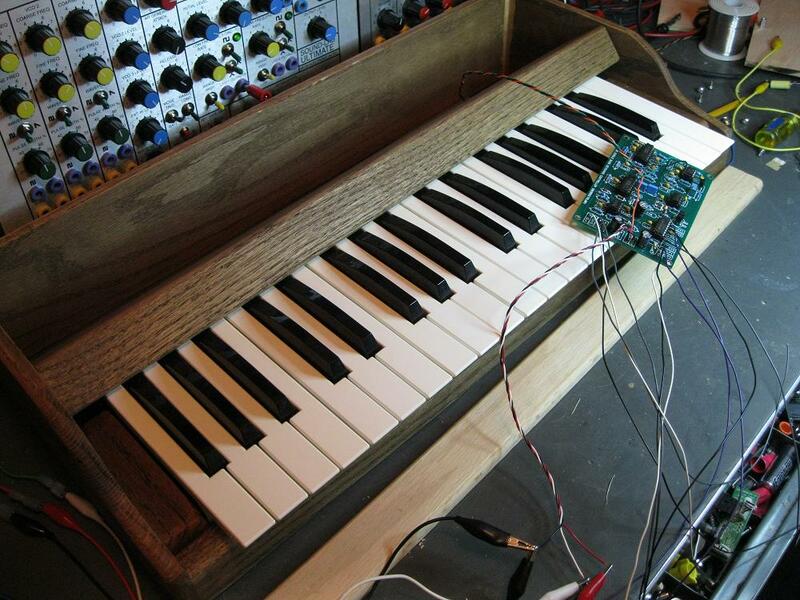 Stuffed the Keyboard controller board - and salvaged a keyboard from an old organ. 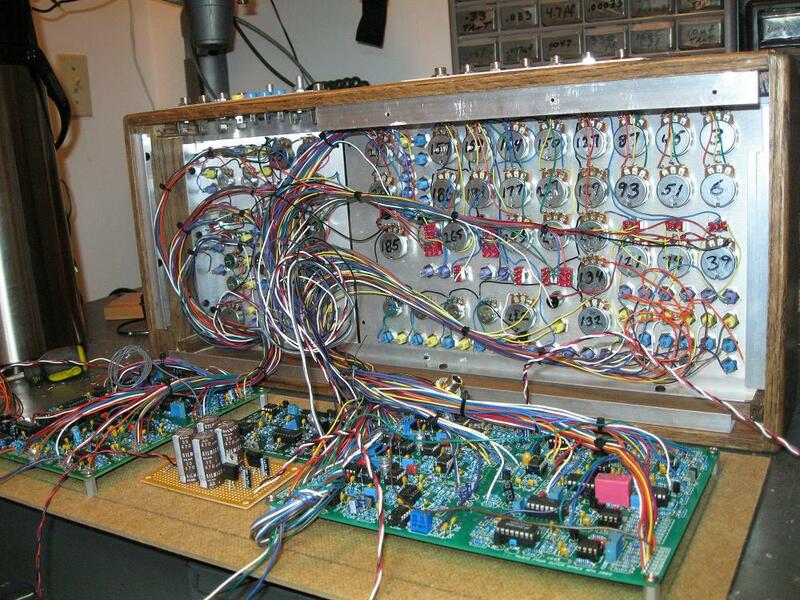 Rear panel wiring is now done on the 'Ultimate' - I'll get that done on the expander next. I started the flying wires connecting the Ultimate board and panel. 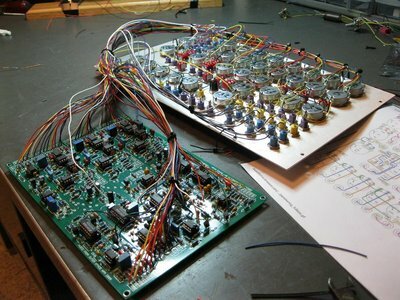 I got the VCO's wired and a couple other bits - there are a ton of wires on this thing. 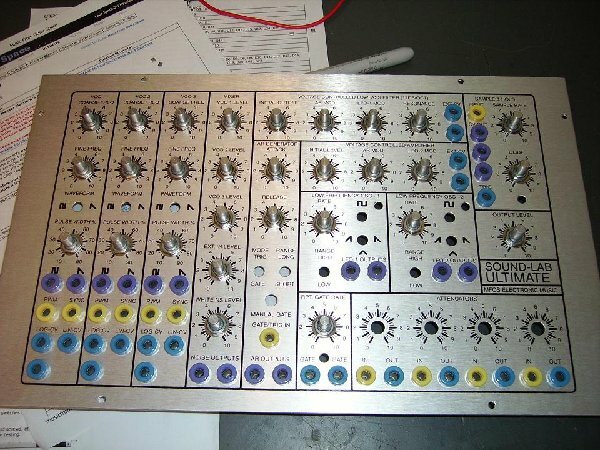 I'll chip away at this then start on the Expander and keyboard assembly. 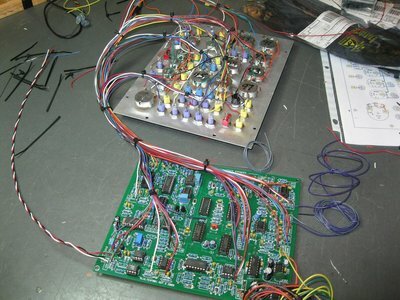 VCO 3 was not working initially - turned out to be a bad TL072. VCA did not work - I had placed a 1.8 ohm resistor rather than 1.8k resistor in the VCA circuit... Oops. Considering the size of the project I was pleased with those being the only issues. Flying wires for the 'Expander' done and tested it. The only issue I had on it was the single 'jumper' required on the PCBoard. As far as I was able to see from the documentation there was no mention of this jumper. It's plainly marked on the board, but I just was not looking for it. Without the jumper in place the VCF does not work. 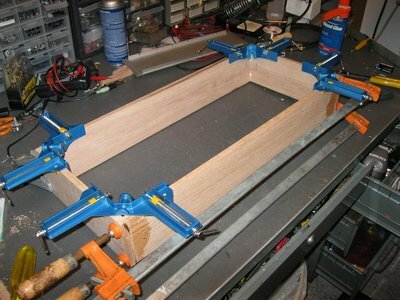 I used Oak for the case and mounted aluminum "L" stock around the edges for the front and rear panels. I used a "Dark Walnut" stain on the Oak. 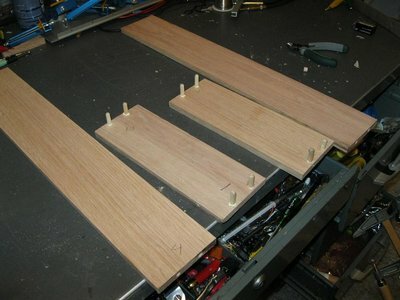 I started on the flying wires for the Aux panels and got the PC boards mounted to the back panel. I used masonite for the back panel. 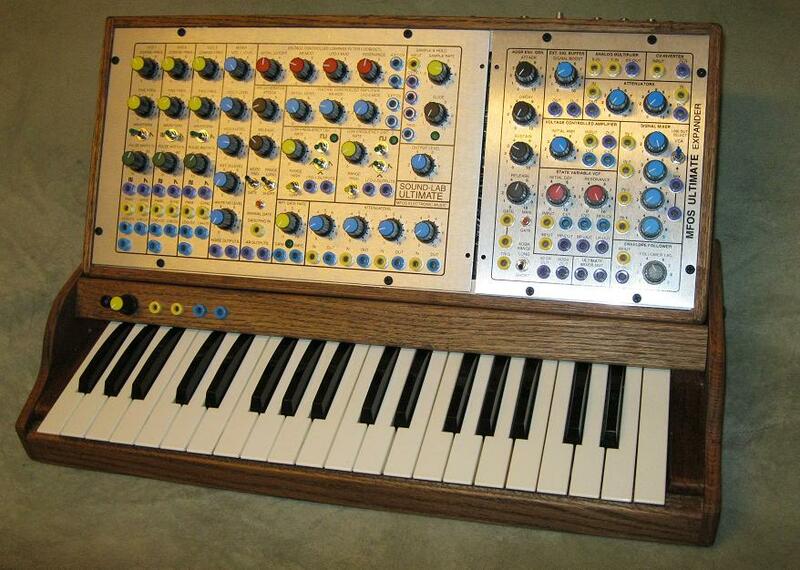 I spent quite a lot of time trying to figure out how to attach the synth unit to the keyboard. 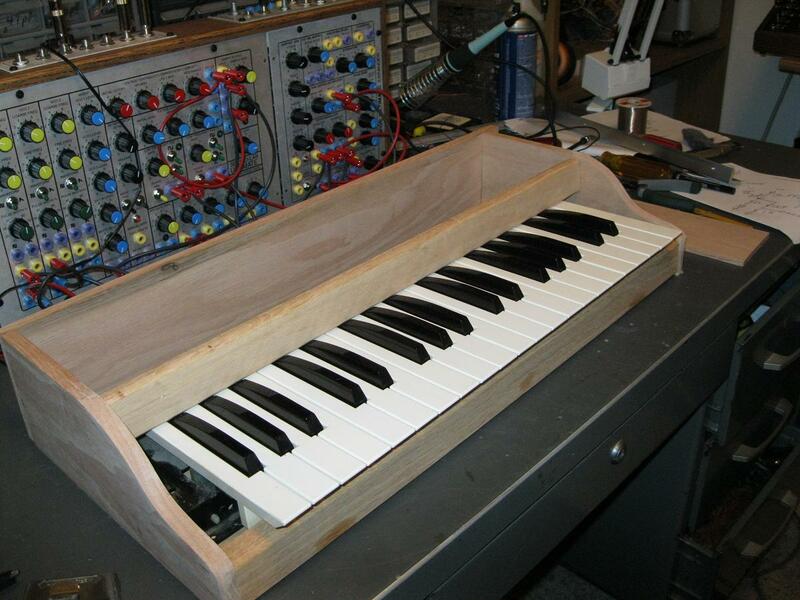 I was initially looking for a fold down panel so I could easily transport the synth, but it became clear that was going to increase the complexity and size, so I decided to 'dock it', but with the ability to remove a couple bolts to allow removal of the synth unit. Once that decision was made they keyboard case went together quickly. 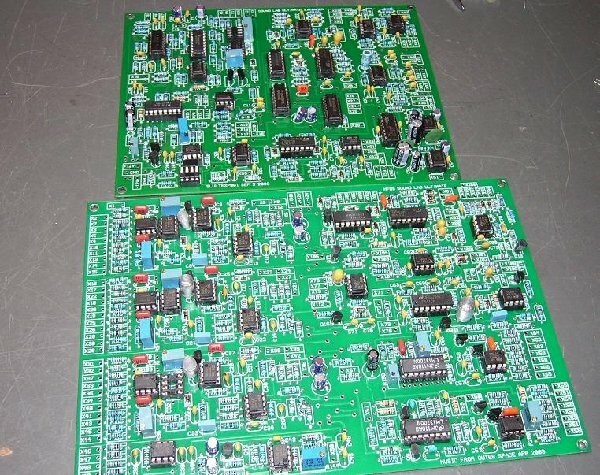 Each has it's own power supply built in, but they operate from one supply while mated. I built a small monitor amp (LM386) and speaker into the case - it's certainly not very loud, but allows me to play it (in a quiet room) without an additional amp, or having headphones on. I'm quite happy with how the project turned out. 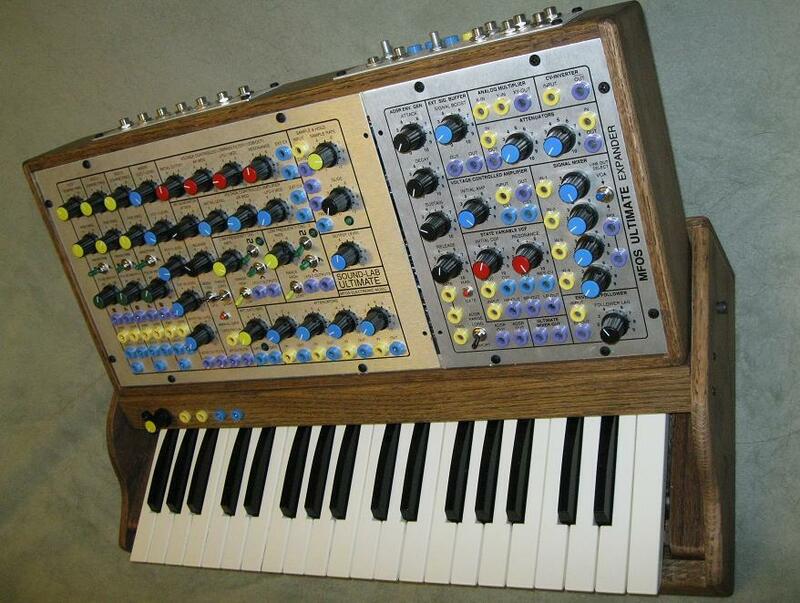 The VCO's were easy to calibrate to 1 volt/octave, and the keyboard works quite well. It sounds great, stays in tune - and is very fun to play.